On February 14th, 2017, the last of my company’s physical servers were powered-off and then scheduled to be unracked and boxed for shipping out of the co-location hosting data centre. The physical servers that my company had invested in and setup to power our development, testing, support and client application requirements were no longer needed to run our virtual machines (VMs). We decided to move all of our VM infrastructure to Azure since it was the leading digital-transformation enabler in Canada that could meet all of our technical needs as well as those of our clients. A VM is a software computer that, like a physical computer, runs an operating system and applications. The VM is comprised of a set of specification and configuration files and is backed by the physical resources of a host computer. Every VM has virtual devices that provide the same functionality as physical hardware and have additional benefits in terms of portability, manageability, and security. The VM lift-and-shift approach is a common cloud migration path where companies replicate in-house VMs in the cloud with little or no re-design. For a company with a limited number of VMs in a simple configuration, it is generally a fast and relatively straight-forward migration to the cloud. The issues arise when there are complex interactions between multiple VMs and the hosted applications that may require a lot of careful planning and testing of the migration to the cloud. Microsoft has provided migration and planning tools such as the Migration Assessment Tools and Azure Site Recovery (ASR) Deployment Planner. Business Continuity and Disaster Recovery (BCDR) are closely related practices that describe an organization’s preparation for unforeseen risks to continued operations. Azure Site Recovery (ASR) services can be an important part of a company’s BCDR strategy. ASR was named an industry leader by Gartner in 2016 for its completeness of vision and ability to execute. ASR can also be used to migrate your on-prem VMs to Azure. Migration scenarios include moving from a physical server to Azure, Hyper-V to Azure and VMware to Azure with different sets of tooling. 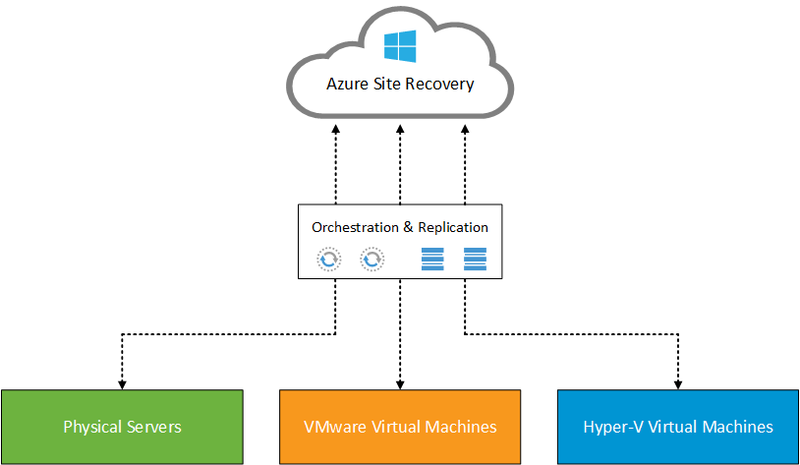 ASR uses the same principles as Hyper-V Replica where a maximum Recovery Point Objective (RPO) can be specified; 30 seconds, 5 minutes or 15 minutes when doing a planned failover to Azure. ASR also ensures there is no data loss. Unfortunately, many corporate executives and IT administrators still view public cloud platforms as a collection of VMs running in someone else’s data centre. The lift-and-shift model for migrating VMs from on-prem to Azure might be a very time and cost-effective solution as an initial step but the true cost and technical benefits come from reviewing and adapting to different cloud models over time. Otherwise, cost savings and efficiencies may not be fully realized in the cloud. IaaS gives you a server (virtual machine or VM) in the cloud that you have complete control over. With an Azure VM, you are responsible for managing everything from the operating system on up to the application you are running. This cloud model will feel most like a typical on-prem VM where you use a ‘remote desktop connection’ (RDC) into the server to manage it. On Azure, these VMs can be scaled up or down either manually or automatically to meet changing performance requirements and to manage costs. PaaS solutions appeal to developers who want to spend more time coding, testing, and deploying their applications instead of dealing with hardware-oriented tasks such as managing security patches and operating system updates. It will also save IT admins a large amount of time since they no longer have a VM or operating system to manage and backup. 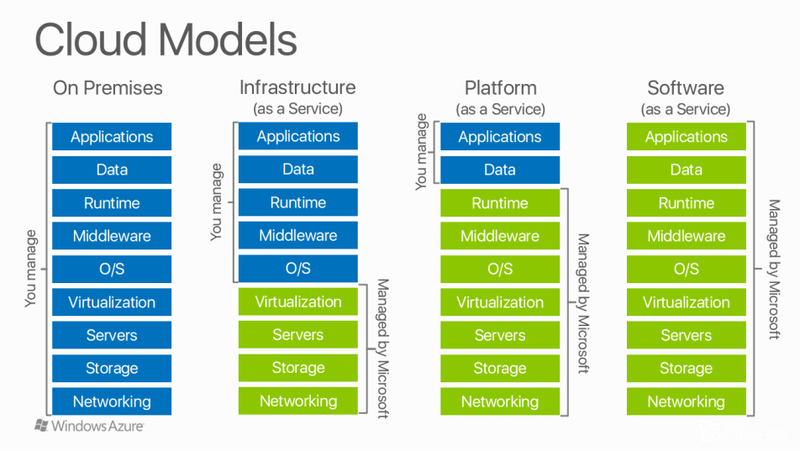 Azure App Service is a PaaS solution. It is by far, the easiest, cheapest, and fastest method of getting your application to the cloud. Azure App Service gives you the least amount of configuration control over your application, which is perfect for simple web applications that do not require more complex configurations for scaling and data processing. 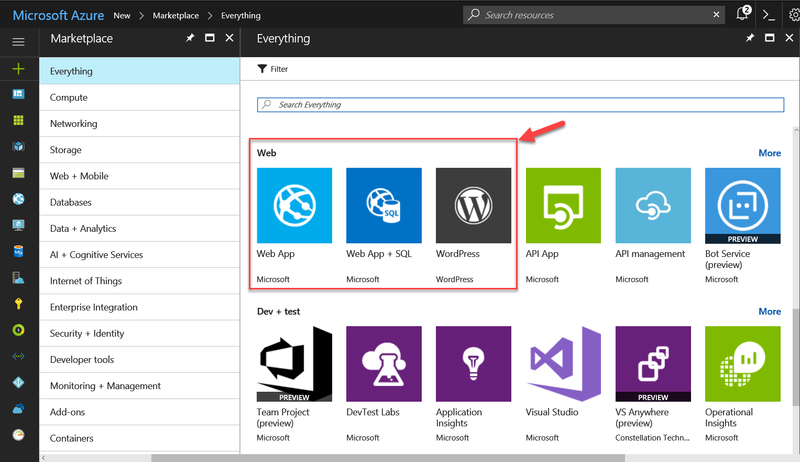 You can even include a MySQL or SQL Server database when provisioning an Azure Website through the Azure Management Portal. Once your Website has been configured, simply update your Web.config (or similar) with your new database’s credentials. Most SaaS applications today are built on a cloud platform due to the low cost of entry – with prices continually falling – and the ability to scale up as your business needs grow. You can select and configure many applications from the Azure Marketplace such as a fully functional WordPress site with a MySQL database within a few minutes as a SaaS offering. No code, no deployment hassles, and minimal configuration. SharePoint Online, when you extend its functionality, is generally considered a PaaS solution even though using its built-in functionality only may be considered a SaaS solution. It depends on how you use it. Office 365 and Exchange Online are SaaS solutions running on Azure that will allow you to replace your on-prem hardware and software without a migration to the cloud.